On the third day, we went to the Sikkim Himalayan Zoo. It was day of little rain and much mist. The walk into the zoo was surreal because of the clouds that accompanied us. We could spot very few animals actually, but the walk around the little zoo was great. The red panda was undoubtedly the show stealer. However the whole place looked rather unkempt and uncared for. In any case it was a far cry from the conditions in our Vandalur zoo. The animals at least looked well fed and well rested. After a quick lunch of some white rice and vegetables, we headed off to the Ranka Monastery, also known as the Lingdum Monastery. Even if it’s rather recent and there’s no historical significance to the place, the scale of its construction and architectural beauty floored us completely. It’s a treat to the eyes through and through. The entrance is flanked on either side with beautiful prayer wheels. The courtyard is huge and leads to the inner sanctum, where a large-sized Buddha sits right on top. 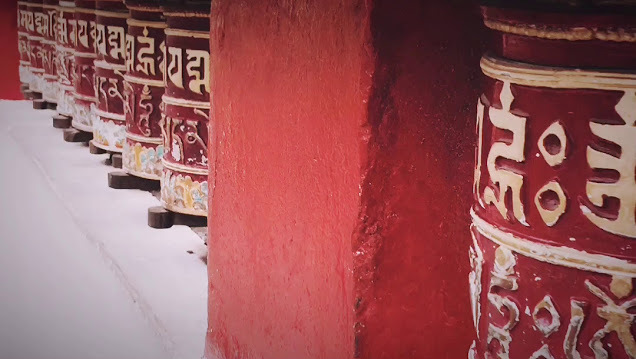 The entire temple is covered with beautiful, traditional Thanka paintings of Sikkim. The monastery is surrounded by forests and that makes it most picturesque. No wonder it’s caught the fancy of Indian moviemakers. Pictures of actors who visited the monastery decorate the canteen walls in the monastery. Our Vikram and Samantha were there too; apparently they were shooting the movie 10 Endrathukulla. The next day we left Sikkim early with lots of memories of this abode of the gods and left a bit of us in Sikkim. We’ll perhaps go there another time and visit the many places we couldn’t because of the monsoons. Until then, we shall meditate on the quintessential feature of Sikkim, Om Mani Padme Hum, which now adorns the entrance to our home. The trip had indeed brought us rain, rest, love, thrill, and deeper meaning. The next day morning, all of us were up and ready by 8. At 8:30 the most awaited phone call came, declaring the happy news of the permit. The Innova was to transform into a Formula 1 racing car in under 10 minutes. We would be climbing to about 14000 ft and so he began telling us about the various things we might encounter on our ascent. Well, landslides had by then become a household term, and so he talked about clouds blocking our vision completely or torrential rain that could bring with it huge boulders or simply lack of oxygen that can cause instant coma. What did he just say? Lack of oxygen? We just laughed it off, but got ourselves some chocolates and popcorns, touted to be an antidote to oxygen deprivation. We were getting ready for the most adventurous part of the trip. Soon we left the hustle bustle of Gangtok and were going up, up, and up. Slowly and steadily, we could experience the slow descent in temperature. At one point, our hands were turning numb and we were blowing warm air into our balled fists and rubbing them together to stay sane. The ride was scenic with beautiful views of the Himalayas with their cloud cover, lush greenery, and waterfalls bringing pristine, clear water from the glaciers high up in the mountains. Chandru stopped the car near a little waterfall for us to fill our bottles and play in it for sometime. After drinking our fill, we resumed our journey. We must have been at least 10,000 ft above the mean sea level. We entered the clouds. It was all white, cold, and eerie. It was just us in the Innova, surrounded by majestic mountains, clouds, and lakes. If you listened carefully, you would be able to hear silence. Deafening silence. No wonder, they named the pass, Na-thulla, which means the pass of the listening ears. We were driving through mist and cloud and in zero visibility. “I can drive on the road with my eyes closed,” declared Chandru, trying to reassure us. With some effort, we could see some army camps and very fit looking defense personnel busy patrolling. 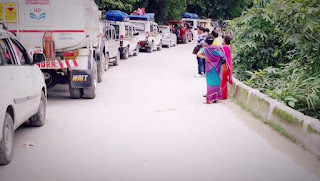 Oh yes, we were heading towards the country’s border. No wonder, the roads were peppered with check points and military uniforms. A few kilometers on, tiny shacks selling Chinese jackets for throwaway prices came into view. We picked one each and off we went. As we drew closer, the air started to get palpably thinner. We’ve never been in such conditions ever before. A closest experience could have been a Doddabetta or a Nainital bus ride through a cloud cover. But, this was proving to be something else. Even as we were wondering about how people almost centuries ago were negotiating these tricky terrains without vehicles powered by petrol or diesel, simply out of nowhere emerged these hordes of yak with their shepherds covered from head to toe in their traditional Sikkimese clothes. We decided to do a yak ride for Kavin on our way back, since Nathulla was still some distance away. As Nathulla drew closer, whatever little civilization there was thinned out. In fact, there was not a single soul as the trudge up the Nathulla began. You would spot an occasional army man doing his patrol amidst the thick clouds. But that was all. The cars had to be stopped at least 1 kilometer or 2 away. Chandru told us to be careful to not let Kavin walk on his own, and wishing us luck he drove away. The entrance to Nathulla is framed with an arch, whose style is unmistakably a happy coming together of both Sikkimese and Chinese motifs, which for someone as untrained as me seemed rather similar with dragons in green and yellow. Few meters on, start the steps that will take one to the actual summit of the Nathulla pass. It didn’t quite look as threatening as it was made out to be. We got off the car and in another few minutes, it happened. For one dizzying moment, air literally drained out of our lungs. In no time, we were holding on to each other for air, literally. We looked at each other and smiled at this rather daring adventure we had undertaken. Kavin on the other hand seemed unfazed and began climbing the steps. We, on the other hand, were huffing and puffing to climb even 5 steps in one go. Mercifully, there was a café en route. Never in the past did the sight of a shack gladden my heart as much. After a short break, R offered to stay with Kavin, told me to go on, and stuffed some chocolates in my hands and asked me to be safe. I would be completely incommunicado, and we really didn’t know what awaited us up the hill. The experience was rather unsettling. We were on terra firma but not quite, actually. Anytime, we could be plunged into nothingness. I took climbed the steps slowly, but steadily. I could sense my lungs working overtime, and also came to the terrible realization of how unfit I was. But this was no time for regret; I had to survive this. I continued climbing when suddenly I was losing my sense of sound. I could no more hear, everything was beginning to turn white. With some effort, I pulled out the bar chocolate and bit a chunk of it. In no time, things began to get normal. Whoever thought chocolate was a lifesaver. Not me, certainly. Some more chocolate and I was at the summit, and there was just clouds and more clouds covering the buildings. A rope was tied to indicate the boundary between the countries. That’s it? No fanfare like the Wagah boundary? Slowly, the structure on the other side emerged through the clouds. I could make out a bright red star and some men working atop. I waved to them, and they waved back. And that was the high point of our entire trip. They army personnel also pointed the gate through which goods get exchanged between Indian and Chinese traders. They also told us how during the Manasarover Yatra the gates are opened for thoroughfare. I returned with the resolve to get fit and do that yatra; the whole place seemed to lead right into heaven. On our way back to Gangtok, we stopped at the Tsomgo lake (pronounced Changu) and played with the yaks. Kavin rode on one of them and had some fun. The lake is supposed to be a very ancient one and quite holy to the local people and the Buddhists and the Hindus, alike. So holy that people don’t even fish in these waters. The water comes from the melting of snow in the surrounding mountains. Then came the Baba Mandir, which is actually a shrine built in the memory of a army man who was killed during a war or crossfires. But his body was not found until he appeared in a colleague’s dream and told him where to look for his body. They find and cremate his body. And since then legend has it that Baba appears in the dreams of his colleagues and to this day warns them of any issues and averts wars or crossfires. So a couple of shrines have been built in his memory and prayers are recited every day. We visited only the new shrine built at a lower altitude and took the sugar candies given as the prashad. Around here, Chandru found some little plants and hungrily collected a bunch of them. He offered a small twig for us to taste. It was sharp and pungent, but the aftertaste lingered for a while. He said it was a local herb, very good for health, and rather rare in lower altitudes. The ride back was more or less uneventful, except for the yummiest momos we got to taste en route. The shopkeeper sold only veg momos and she made them with just fresh cabbage, carrots, and some onions. We sat there in that little shack on wooden benches, savoured the momos, and looked out from a little window. The beautiful mountain waters were flowing downhill, as the rain hammered on the tin sheets that covered the shack. After what seemed like eternity, we began our journey back to Gangtok.